Enniskillen Rotary Club's Santa Mobile, a familiar spectacle in the county in the run up to Christmas marks a significant milestone this year - its 18th birthday. The colourful vehicle, which has become one of the traditional sights and sounds of the festive season, once again recently received its starter's orders as it looks forward to its annual fundraising journey. 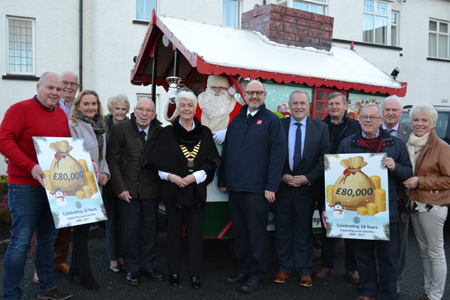 Since its launch 18 years ago, the Rotary Santa Mobile has raised over £80,000 for charitable causes in Fermanagh. David Hamill, a Past President of the Rotary Club of Enniskillen recalls that it was first launched on December 7, 2000. He was President of the Club that year (2000 to 2001) and explains how the initiative came about. He recollected that Rotarian John Trimble joined the Enniskillen club on his return from St. Asaph, in North Wales, where he had been a member of the Rotary Club there. "They had a Santa Mobile," said David, who mentioned that John presented the idea to their club and it came to fruition in David's Presidential year. David paid tribute to the skill of Enniskillen Rotarian Wilfie Mahood, who designed and built the vehicle for them. "It is all down to Wilfie and his skill," highlighted David, who mentioned that the Club are very thankful to the Rotarian, who was recognised for his work with a Paul Harris Fellow. David also acknowledged Jayne Daley, whom he said did all the graphics for them. "The same structure is in use in its 18th year," said David, who reports that it remains in as good a condition now as it was when it was first launched. He gave a special mention to Rotarian Archie Birrell and said that due to the care he has taken of the vehicle over the years, it has required minimal maintenance. The Santa Mobile, with the support of Santa Claus, his reindeer and elves, has raised in excess of £80,000 over the 18-year period. David, who is appreciative of the public's generosity over the years, highlighted that the money raised locally in the collections goes to local charities and causes in Fermanagh. This has always been an important factor for the Club, according to David, who says "everyone is very supportive." The Santa Mobile, in its very first year, was set in motion from the showroom at T.P. Topping Ltd. in Enniskillen, where it had been displayed that year. Now the launch takes place at the Killyhevlin Hotel, where the Rotarians meet for their weekly luncheon. To mark its launch on Monday, December 3, 2018, representatives of St. Vincent de Paul and the Salvation Army were in attendance to receive cheque presentations. A presentation was also made this year to Enniskillen Food Bank under the Lakes Vineyard Church. A successful annual venture for Enniskillen Rotarians, it was given its seasonal send-off by current President Siobhan O'Reilly, who was delighted to perform this role. On behalf of the club, she extends her thanks to the public for its backing and helping the club to achieve its goals in supporting local causes. David Hamill always draws up the rota for the Santa Mobile, which traditionally starts its Christmas run at the Diamond, Enniskillen. This year's festive dates will include Enniskillen, December 11, 12, 13 and 15, and Irvinestown on December 22.